for a 1-day trip leaving from San Pedro Departing on Thur May 9th, 09:00 PM. This will be a freelance trip heading to the Islands. Book Online and Save with a special early season price of $250, Normal Price is $295 Meals and permits not included and will be collected on the boat. Simply book right on line or call for reservations at 310-328-8426.
for a 1-day trip leaving from San Pedro Departing on Thursday June 27th, 09:00 PM. This will be a freelance trip heading to the Islands. Book Online and Save with a special early season price of $250, Normal Price is $295, Meals and permits not included and will be collected on the boat. Simply book right on line or call for reservations at 310-328-8426. The Triton teams up with 976-TUNA for another full day 5 to 5 trip leaving Thursday, Aug 8th. 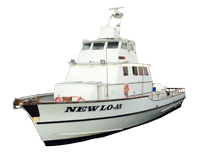 The trip is limited to just 26 anglers and will be heading to Catalina for yellowtail, seabass, calicos and more. Book Online and Save with a special early season price of $100, Normal Price is $120.00. Meals and permits not included and will be collected on the boat. Simply book right on line or call for reservations at 310-328-8426. 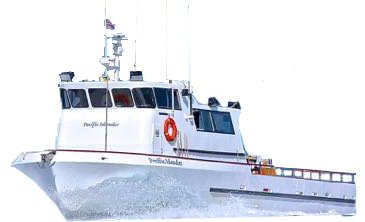 The Pacific Islander teams up with 976-TUNA for a 2-day trip leaves from Channel Islands Sportfishing on Sunday Aug 17th. This will be a freelance trip heading to the Islands for seabass, yellowtail, and rockfish. Early Season price is $275.00 normal Price is $400.00. Meals and permits not included and will be collected on the boat. Simply book right on line or call for reservations at 310-328-8426. The Triton teams up with 976-TUNA for another full day 5 to 5 trip leaving Thursday, Sep 19th. The trip is limited to just 26 anglers and will be heading to Catalina for yellowtail, seabass, calicos and more. Book Online and Save with a special early season price of $100, Normal Price is $120.00. Meals and permits not included and will be collected on the boat. Simply book right on line or call for reservations at 310-328-8426. Render time: 0.8881 sec, 0.0358 of that for queries.